Directions (Q. 1 – 5): what value should come in place of (?) in the following questions? Directions (Q. 6 - 10): Study the following information carefully and answer the given questions. The following line graph shows the total kilocalories burned by 2 individuals (P and Q) on treadmill in 5 different days in a certain week. 6. 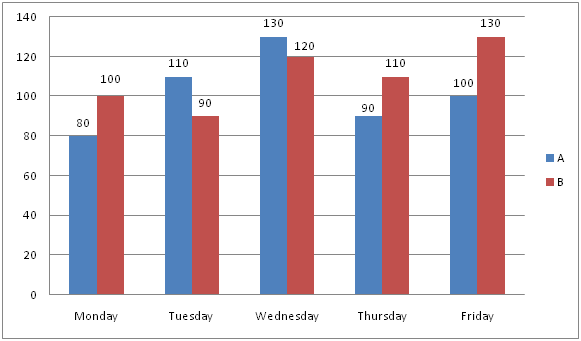 If the total kilocalories burned by P and Q are increased by 10 % and 20 % respectively from Friday to Saturday, then find the ratio between the total kilocalories burned by P in Wednesday and Saturday together to that of total kilocalories burned by Q in Thursday and Saturday together? 7. Find the difference between the total kilocalories burned by P to that of Q in all the given days together? 8. Total number of kilocalories burned by P in Monday, Tuesday and Friday together is approximately what percentage more/less than the total kilocalories burned by Q in Wednesday, Thursday and Friday together? 9. If the average kilocalories burned by P in Monday, Wednesday, Friday and Saturday together is 115, then find the total kilocalories burned by P in Saturday? 10. Total kilocalories burned by P in Monday and Tuesday together is approximately what percentage of total kilocalories burned by Q in Wednesday? 6) If the total kilocalories burned by P and Q are increased by 10 % and 20 % respectively from Friday to Saturday, then find the ratio between the total kilocalories burned by P in Wednesday and Saturday together to that of total kilocalories burned by Q in Thursday and Saturday together? 7) Find the difference between the total kilocalories burned by P to that of Q in all the given days together? 8) Total number of kilocalories burned by P in Monday, Tuesday and Friday together is approximately what percentage more/less than the total kilocalories burned by Q in Wednesday, Thursday and Friday together? 9) If the average kilocalories burned by P in Monday, Wednesday, Friday and Saturday together is 115, then find the total kilocalories burned by P in Saturday? 10) Total kilocalories burned by P in Monday and Tuesday together is approximately what percentage of total kilocalories burned by Q in Wednesday?